I’ve always wanted to make one of these, but never got around to it until recently. However, after finding the most adorable tiny flyback in a 5 inch TV, I felt it needed a good job. I tried a few different circuits to make a plasma speaker, but both just killed my MOSFETs. On 4HV someone recommended a circuit involving the 3525 pulse-width modulator IC, so I decided to try that. About ten dollars and 1 week later my parts arrived, and I put it together in an hour or so. To my surprise it worked fantastically. Update: Built a better one! Use that circuit instead. 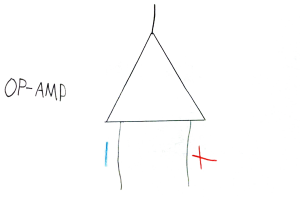 In the above circuit the 10kΩ pot controls the switching frequency. A lower frequency means higher voltage from my testing, while a higher one means more amps. The sweet spot seems to be around 40-60 kHz. The mosfet doesn’t have to be an IRFP260; It can be any fet that can handle at least 100 volts, >30 amps. It must be heatsinked very well with plenty of thermal paste, as it gets really hot, really quick. In fact I had to use a bucket of ice water to cool it on high power runs! Also, too loud a signal can overload the chip. When you put audio in, set the volume to 0, then slowly turn it up. When the music becomes distorted that’s as loud as it’s getting. It’s not terribly loud, but it is still easily heard in a quiet room. You must have a clean audio source too, no electrical noise. I used my computer, and it would appear that iPods don’t work too well. It’s trial and error with the sources. Below is a youtube video of the circuit in operation, playing John Lennon’s Imagine. But wait, how does a plasma speaker work? It works by something called pulse-width modulation. By sending more current through an arc, you produce a hotter arc. Hotter arcs will have a higher pressure, and by varying the current through an arc you create varying pressures, something commonly known as sound. 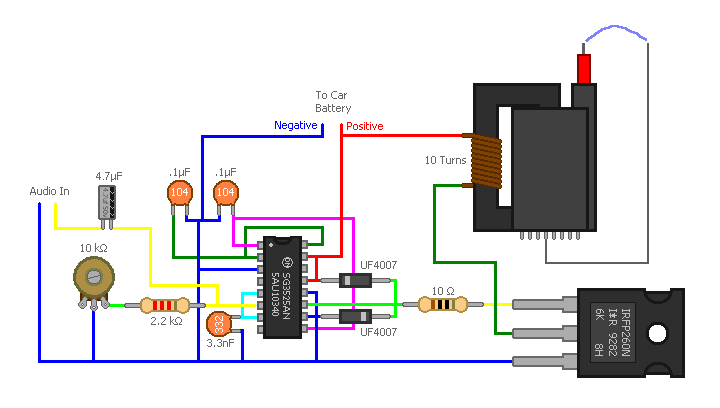 Now this circuit uses PWM to accomplish that. By shortening the width of the pulses to the gate you can control the current that flows through the flyback. By changing those pulses to the tune of music, the arc’s current and pressure will vary in tune with the music, thus producing sound. the video has been blocked because of copyright stuff… can you repost or something? 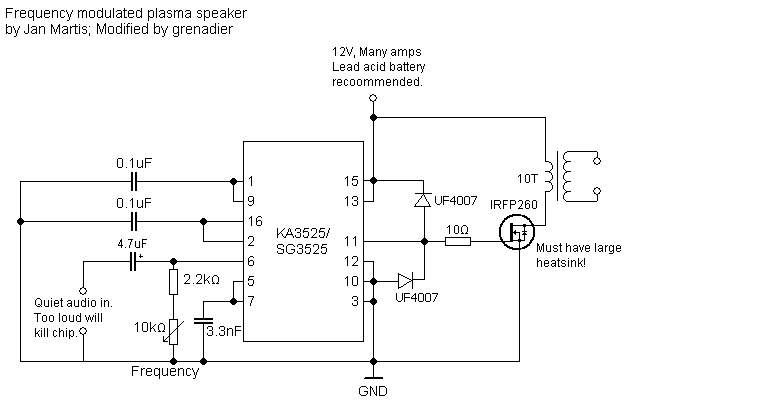 I’m going to build a plasma speaker like you did (plasma speaker 1) and I’m wondering which is the lowest voltage that this cuircuit runs on? And how many amps does this ciurcuit need? Just wondering, is the power to the transoformer completly supplied by the mofset coil? Have you tested building this into a glass beaker or forming the arg inside of a test tube to amplify the sound? I wonder: If we use 500V MOSFET, connect it to builded-in FBT primary, power it from rectified main and add RCD snubber across primary, it would run much cooler and without big step down transformer as PSU, isn’t it? As for to loud music problem, maybe it is possible to clamp somehow input signal?